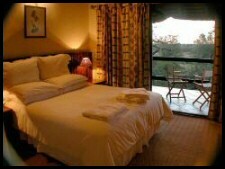 Book our 3 night/4 day special for R5480 per person for the 3 nights. We are situated in a conservancy alongside the Crocodile River in the southern Kruger and the animals wander freely around the lodge. 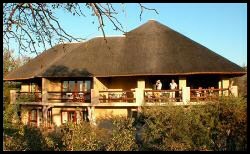 Full English breakfast daily, served at the lodge or inside the Kruger Park, overlooking a waterhole. Traditional 3 course dinner served by candle light in our boma under the African sky. Relaxing on our spacious balcony or upper sun deck next to our private, sparkling pool with spectacular views over the Crocodile River of the Kruger Park - great for sun downers! Self-guided walks along the Crocodile River. A morning Walk with armed guards in the Kruger Park, OR another drive in the Park, OR a visit to a Swazi Cultural Village (no visa necessary). Return transfer from KMIA airport in Nelspruit (KMIA or MQP). The best of Africa distilled into one lodge - Bushwise Safaris combines upmarket luxury accommodation with the real Safari experience. Situated on the banks of the Crocodile River overlooking the Kruger National Park, Bushwise Safari Lodge combines the real Kruger Safari experience with luxurious accommodation boasting a unique ambiance true to the safari adventure you are seeking. Watch the Kruger National Park and the Crocodile River (where a variety of wildlife often drink at the water’s edge) at your leisure from the comfort of your vantage point on the upper deck, bar area or swimming pool. Become part of the African night, and hear the roar of lions, the call of hyenas and the grunting of hippos coming from the dark. From our Safari Lodge base, we offer our guests the thrill of personalized safari excursions into Kruger in our open safari vehicle to seek out the Big Five and experience all the wonders of this unique eco-system. The South Eastern part of Kruger where we operate is well known for its superb game viewing, with frequent sightings of lion and leopard. 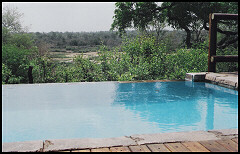 We offer a variety of safari activities as well as excursions to suit every taste, timetable, and pocket - from walks in the Kruger Park with an experienced guide, half day safaris, night safaris, bird watching walks and tiger fishing on the Komati River, to excursions to places of interest in the area as well as the neighbouring states of Mozambique and Swaziland. Our option of an all-inclusive rate brings the luxuries of the Bushwise Safari Lodge as well as all the safaris and excursions within the reach of everybody. 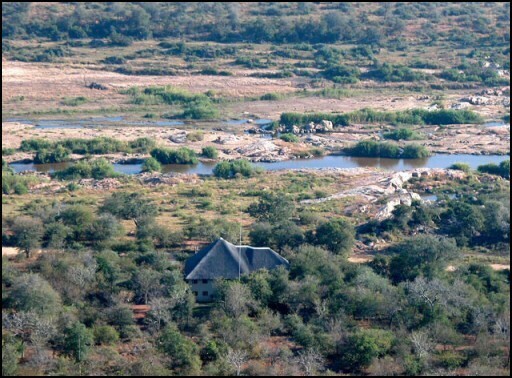 Directions to Bushwise Safaris & Safari Lodge: From E’Malahleni (Nelspruit) follow the N4 towards Malelane and Maputo. Don’t take the turn off to Marloth park, it is a dirt road. Continue until you get the Tenboshc turn off, about 14kms after you pass the small town of Hectorspruit, and turn left. Continue for 10 km until you get the entrance gate of Marloth Park. Continue along Olifant Road for approx. 4 kms and turn right into Waterbok str, right into Swartwitpens str, left into Njala str. About 1 km further you will get to a T-junction with the river in front of you, we are the last building on your right, on the corner of Njala and Seekoei street.